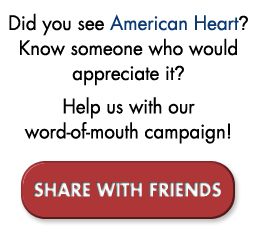 Did you see American Heart? Would you like to share a comment or weigh in on some of the issues confronted in the documentary? Submit a comment here. LOOKING FOR THE DISCUSSION GUIDE? You'll find a Discussion Guide and lots of other American Heart resources downloadable for free at our partner website. Thanks to all the tremendous support and feedback we've received over the years. And a big hug for everyone who tuned in for our official nationwide broadcast on the PBS World Channel! September 26, 2018 - St. Paul, MN: It is with sadness that we report the passing of Alex Gliptis. For anyone who has seen American Heart, Alex's warm smile and unshakeable spirit has surely left an indelible mark. Read more here. July 13, 2018 - St. Paul, MN: We continued our annual tradition of sharing American Heart with the Physician Assistant Masters students at St. Catherine University. We were lucky enough to be joined again by Robert Carlson for a Q&A with the future PAs! July 13, 2018 - St. Paul, MN: American Heart screened as part of the 4th Annual International African Mental Health Summit. Program included a compelling post-screening discussion. June 1, 2018 - St. Paul, MN: American Heart had the honor of being presented at the national meeting of the Physician Assistants for Global Health. September 21, 2017 - St. Paul, MN: Director Chris Newberry was invited to present American Heart and participate in a discussion at the University of Minnesota's Center for Global Health and Social Responsibility. Check out the guest blog post on HealthAffairs.org written by American Heart director Chris Newberry: "How Paid Family Leave Would Have Made Life Easier for One Family"
Check out this thoughtful piece on American Heart which ran in the St. Paul Pioneer Press in January 2015. 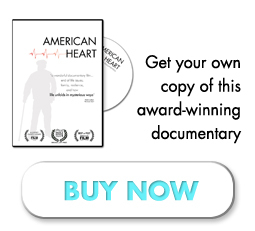 On the heels of a successful film festival run, where the film took home six documentary prizes in all, American Heart accepted invitations to screen at Global Health events around the country including a Washington DC symposium convened by the U.S. State Department. American Heart enjoyed a nationwide television broadcast on the PBS series America ReFramed in 2015, and the film received a regional EMMY® Award in the Topical Documentary category.